During the preceding four weeks, we have noticed how the malice of Jesus’ enemies has been gradually increasing. His very presence irritates them; and it is evident, that any little circumstance will suffice to bring the deep and long nurtured hatred to a head. 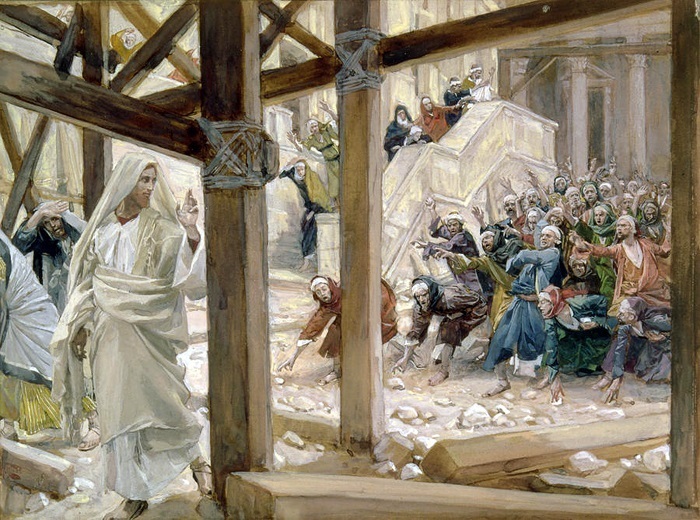 The kind and gentle manners of Jesus are drawing to him all hearts that are simple and upright; at the same time, the humble life he leads, and the stern purity of his doctrines, are perpetual sources of vexation and anger, both to the proud Jew that looks forward to the Messias being a mighty conqueror, and to the Pharisee, who corrupts the Law of God, that he may make it the instrument of his own base passions. 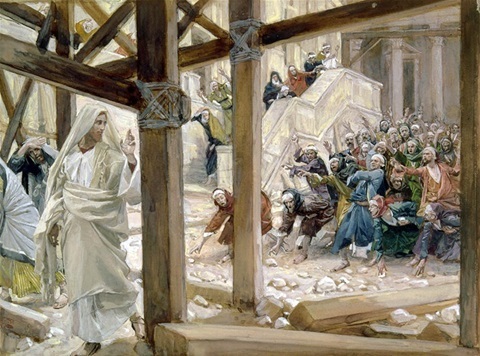 Still, Jesus goes on working miracles; his discourses are more than ever energetic; his prophesies foretell the fall of Jerusalem, and such a destruction of its famous Temple, that not a stone is to be left on stone. From hence, everything around us urges us to mourn. The images of the Saints, the very crucifix on our Altar, are veiled from our sight. The Church is oppressed with grief. During the first four weeks of Lent, she (the Mother Church) compassionated her Jesus fasting in the desert; his coming Sufferings and Crucifixion and Death are what now fill her with anguish. She would not have her children come to the great Day of the immolation of the Lamb, without their having prepared for it by compassionating with Him in the Sufferings He endured in their stead. We read in to-day’s Gospel (provided below), that the Jews threaten to stone the Son of God as a blasphemer: but his hour is not yet come. He is obliged to flee and hide himself. It is to express this deep humiliation, that the Church veils the Cross. A God hiding himself, that he may evade the anger of men, – what a mystery! Is it weakness? Is it, that he fears death? No, – we shall soon see him going out to meet his enemies: but, at present, he hides himself from them, because all that had been prophesied regarding him has not been fulfilled. Besides, his death is not to be by stoning; he is to die upon a Cross, the tree of malediction, which, from that time forward, is to be the Tree of Life. Let us humble ourselves, as we see the Creator of heaven and earth thus obliged to hide himself from men, who are bent on his destruction! Let us go back, in thought, to the sad day of the first sin, when Adam and Eve hid themselves because a guilty conscience told them they were naked. Jesus is come to assure us of our being pardoned! and lo! he hides himself, not because he is naked, – He that is to the Saints the garb of holiness and immorality, – but because he made himself weak, that he might make us strong. Our First Parents sought to hide themselves from the sight of God; Jesus hides himself from the eye of men; but it will not be thus for ever. The day will come, when sinners, from whose anger he now flees, will pray to the mountains that they fall on them to shield them from the gaze of the anger of the Lamb; but their prayer will not be granted, and they shall see the Son of man coming on the clouds of heaven, with much power and majesty (St. Matth, xxiv. 30). This Sunday is called the I Sunday of the Passion (Passion Sunday), because the Church begins, on this day, to make the Sufferings of our Redeemer her chief thought. During Passion Week, a Saint’s Feast, if it occur, will be kept; but I Sunday of the Passion (Passion Sunday) admits no Feast, however solemn it may be; and even on those which are kept during the days intervening between Passion and Palm Sundays, there is always made a commemoration of the Passion, and the holy Images are not allowed to be uncovered. All crucifixes and Images in the Church are covered in violet veils (the color of vestments in Lent) starting on Passion Sunday. The crosses are to be covered until the end of the celebration of the Lord's passion on Good Friday. Statues and images are to remain covered until the beginning of the Easter Vigil, specifically, those veils are removed during the singing of the Gloria in Excelsis. The veiling was associated with Passion Sunday's Gospel (St. John, viii.46-59), in which Jesus "hid himself" from the people. Mercifully look down on thy people, we beseech thee, O Almighty God, that, by thy bounty and protection, they may be governed and guarded, both in body and soul. Through Jesus Christ, our Lord. Amen. Mercifully hear, we beseech thee, O Lord, the prayers of thy Church: that, all oppositions and errors being removed, she may serve thee with a secure liberty. Through Jesus Christ, our Lord. Amen. O God, the Pastor and Ruler of all the Faithful, look down, in thy mercy, on thy servant <Gregory XVIII>, whom thou hast appointed Pastor over thy Church; and grant, we beseech thee, that both by word and example, he may edify all those that are under his charge: and, with the flock intrusted to him, arrive at length at eternal happiness. Through Jesus Christ, our Lord. Amen. At that time: Jesus said to the multitude of the Jews: Which of you shall convince me of sin? If I say the truth to you, why do you not believe me? He that is of God, heareth the words of God. Therefore, you hear them not, because you are not of God. The Jews, therefore, answered, and said to him: Do not we say well that thou art a Samaritan, and hast a devil? Jesus answered: I have not a devil; but I honour my Father, and you have dishonoured me. But I seek not my own glory: there is one that seeketh and judgeth. Amen, amen, I say to you: If any man keep my word, he shall not see death for ever. The Jews therefore said: Now we know that thou hast a devil. Abraham is dead, and the prophets; and thou sayest: If any man keep my word, he shall not taste death for ever. Are thou greater than our Father Abraham, who is dead? And the prophets are dead. Whom dost thou make thyself? Jesus answered: If I glorify myself, my glory is nothing. It is my Father that glorifieth me, of whom you say that He is your God; and you have not known him, but I know him. And if I should say that I know him not, I should be like to you, a liar. But I do know him, and do keep his word. Abraham you father rejoiced that he might see my day: he saw it, and was glad. The Jews then said to him: Thou art not yet fifty years old, and hast thou seen Abraham? Jesus said to them: Amen, amen, I say unto you, before Abraham was made, I AM. They took up stones therefore to case at him. But Jesus hid himself, and went out of the temple. The world’s blest balance thou wast made. And every sinner’s crimes efface. Who conquer’d by the cross below. Amen. V. Deliver me, O Lord, from the wicked man. R. From the unjust man deliver me.